Teen idols have always been a part of pop music going back to Frank Sinatra in the 40s. But it was in the early 70s that we started to see pre-teen idols like Michael Jackson and Donny Osmond. Both were extensions of family groups. Osmond's biggest hit was his 1971 cover of Go Away Little Girl. He was born Dec. 7, 1957 in Ogden, UT. His brothers performed as a barbershop quartet. Their dad took them to Los Angeles to audition for Lawrence Welk. When that didn't work out, they went to Disneyland and sang while strolling through the park. Management alerted Walt Disney and he had them on one of his TV specials. Andy Williams' father saw them and they were regulars on The Andy Williams Show from 1962-69. Then The Osmonds signed with MGM Records. After they had success, it was clear that Donny could be spun off as a solo artist. The Osmonds recorded with producer Rick Hall at FAME Studios in Muscle Shoals. MGM president Mike Curb asked Hall to produce a Donny Osmond album. The first single was a cover of the 1958 Roy Orbison hit Sweet and Innocent and it reached #7 on the Billboard Hot 100. The Donny Osmond Album was certified Gold. A second album To You With Love, Donny was released. The first single Go Away Little Girl topped the charts for three weeks in 1971. Go Away Little Girl was written by Carole King and Gerry Goffin. It was first recorded by Bobby Vee who was a teen idol in the early 60s. But it was Steve Lawrence who topped the charts with the song in 1962. Osmond continued to have success with covers like Freddie Scott's Hey Girl and Paul Anka's Puppy Love. 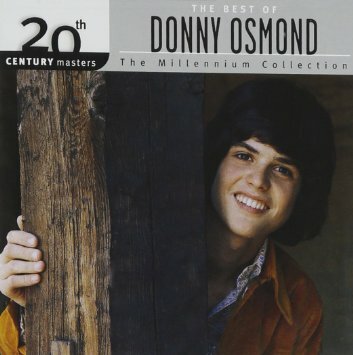 Osmond faded by the mid-70s and that's when he started his variety show with his sister Marie Osmond. You can get all his 70s solo hits on this budget comp. Donny Osmond has been very good at reinventing himself. He returned to the pop charts in the late 80s with Soldier Of Love. And in the 90s he reinvented himself as a stage musical performer with a long run in Joseph and the Amazing Technicolor Dreamcoat. He also won the 2009 season of Dancing With The Stars. And he released the 2014 album The Soundtrack of My Life on Decca in 2014. So Donny Osmond has had tremendous longevity for a teen idol. Here's Donny Osmond performing Go Away Little Girl at the Los Angeles Forum in 1971. Listen to those girls scream. I still remember listening to the Osmonds during the 70's. Loved their music. I liked the video you posted Frank. The group is dressed just like Elvis!!! Lol. And yes those girls are screaming in pure delight. He is something else there. I just thought of something else, I still remember the title of that song being used as an insult by many of the guys at school. It was a bad one. I watched a fight break out between two guys after one of them told the other "Go away Little Girl" then all hell broke loose. Interesting what went on back in those days.